This is a market I enjoy betting on, if mainly for the fact that every year people try to construct an argument why Eastenders won't win it and then Eastenders wins it! 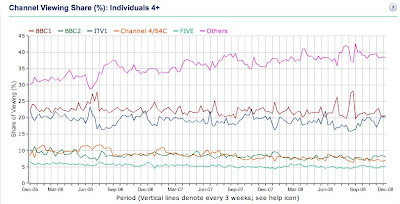 First up, the graph on the left shows viewing share per channel. This in my opinion narrows it down to BBC1 shows only - goodbye Coronation Street and Dancing On Ice. This leaves us realistically with Eastenders, Doctor Who, Strictly Come Dancing: Christmas Special and The Royle Family. Doctor Who is a dark horse and came close last year - missing out by less than a million. I think it will come second this year and is possibly worth a cover bet. Strictly Come Dancing never attracts big, big audiences with it's 'specials' and is worth a lay on Betfair. The Royle Family is second favourite in the betting. I think it is on 1/2 hour too late and possibly it is a show whose time has passed and is no longer attractive to all and sundry. Another lay. This leaves us with 'Enders. It has topped four out of the last five years (Vicar of Dibley being exception) and suspect it will top again. The odds are not brilliant but good enough. Try to use a company which lumps both shows as one (eg Betfair). Well done to Wallace and Gromit backers who backed the clay northerner at 14-1. A very comfortable win with a massive amunt of viewers. I didn't take into account the competing shows enough and paid the price. Annoying but hey, thats bettting. Incidentially, the odds on Eastenders also shifted inwards a lot and by Christmas Eve represented very poor value and probably a lay at around 1.39 on Betfair.